Getting a large sign-up bonus of flexible Chase Ultimate Rewards points. Points take on 25% more value for Sapphire Preferred cardholders when redeemed for travel through Chase Ultimate Rewards. The CSP is one of our picks for the best credit cards of 2019. 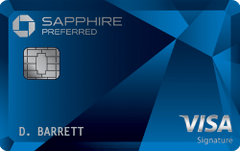 Our take: The Chase Sapphire Preferred card offers valuable rewards for frequent travelers, as well as the potential for savvy rewards card users to glean some extra value out of their rewards.